A welcome addition to modern and historic homes, our single hung vinyl windows build on a classic style with a long history. The wide range of interior and exterior trim options makes it easy to integrate these ENERGY STAR windows beautifully into any setting. The upper sash is fixed in place, while the bottom sash glides effortlessly up and down for simple and durable operating. The sliding pane of our single hung windows also tilts inward to provide easy access to both sides for cleaning. Our windows are tested for energy performance by CSA-certified lab. Our vinyl windows come with a variety of interior vinyl trim options for refined and versatile styling. We combine advanced technology with the finest materials for durable, flawless finishes that will retain their colour year after year. Standard finishing options include wood stain and contemporary and classic rosettes, but we can also accommodate custom colours. We offer four standard vinyl jamb sizes to facilitate a seamless window installation process. For added flexibility we can also provide wood jamb extensions, frame moldings and corner blocks. These interior finishing options are made from a durable lead-free PVC powder compound that requires no maintenance. We craft our brickmolds from a durable uPVC powder compound that is designed to stand up to the harshest elements. This maintenance-free material is available in a variety of sizes and colours, for long-lasting curb appeal. We build our vinyl windows with a high number of internal air chambers for superior insulation, thermal efficiency, sturdiness and sound abatement. Maintenance-free PVC jamb extensions, corner blocks and frame moldings provide added flexibility for interior finishing. 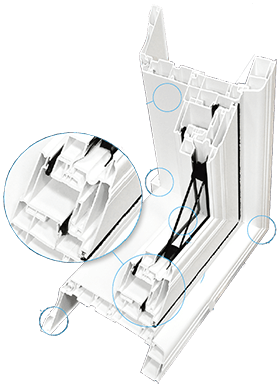 Fusion-welded corners enhance the appearance of the window while eliminating the need for sealants and adhesives. The flawless surface is entirely airtight and watertight. We also weld internal walls to boost the structural integrity of our vinyl windows. Our sealed glass units have an overall thickness of 13/16”. Most of our window styles allow you to choose between different glazing types and thicknesses. These include single, double, triple and Low-E glazing, as well as a decorative glazing that ranges from 3/4” to 1-1/8”. Manufactured from a durable uPVC powder coating, our vinyl windows are maintenance-free and will not warp, crack or blister. They require only occasional cleaning with water and a mild detergent to keep them looking new. For advice on cleaning the different components of your windows, visit our care and maintenance overview.